The valuation approach: Predict revenues, margins and profits and free cash flow. Benjamin Graham taught us that if you are correct about your intrinsic value, the stock price should revert to this within 2-3 years. A good short is the opposite of what is generally considered a good long. The product the company produces should be commoditised, the industry should have low barriers to entry and the returns on reinvested capital low. The valuation should be high compared to either its replacement cost of assets or its long-term free cash flow calculated off normalised margins. Fundamentals to keep track of include the competitive offering as well as industry supply & demand patterns. The Steinhardt model: Front-run other fundamental investors by finding situations where you have a variant view to consensus of what is going to happen. The variant view is usually built on an information edge. When your forecast is proven correct, other investors will adjust their view of the valuation of assets and sell the overvalued stock. Steinhardt emphasizes the need to find the exact catalyst that will cause investors to change their minds so that the price corrects in a short period of time. The Soros model: Investors have an imperfect understanding of the world. An underlying trend in fundamentals can both affect investors biased view on it, and vice versa. This may cause a reflexive boom by which the price increasingly becomes disconnected from fundamentals. A short should not be initiated until the trend has been discredited, at which point the reflexive bubble will burst. Security prices tend to rise along with the country’s currency, which itself is a function of global money flows. Shorting a stock using a valuation approach is risky. First, the investor needs to make long-term forecasts that are better than the average investor. Some factors such as demographics and secular consumption trends may be easy to forecast. Others, such as corporate governance, or the risk that the company will be acquired, are not easily predictable. It is by no means certain that the stock price will end up close to the investor’s calculation of intrinsic value, even if he waits for 2-3 years. Over that time period, the investor will be bombarded with information and price movements that will cause much doubts about the validity of the thesis. If the company is in a commoditised industry, margins are likely to be volatile. Higher margins will cause less informed investors to buy the stock whenever margins rise enough to cause a low current PE ratio. In terms of the valuation of the asset, it is not entirely clear what discount rate to use in the valuation of an asset. Small changes in the discount rate can cause enormous changes in the valuation of a company with open-ended growth prospects. For example, PE ratios in India are almost twice as high as in Vietnam. Can such a disparity really be justified on the basis of expected growth rates or discount rates? If the investor uses the current market discount rate, he is making an implicit assumption that in my view warrants further analysis. Steinhardt’s model also emphasizes the valuation of an asset. But since the exposure is likely to be short-term with a certain catalyst in mind, it does not matter that much if the valuation is off by say 20-30%. The direction is more important. If the investor is able to gauge whether market expectations for a stock are positive, he can be confident that the stock price will fall once fundamentals start to develop in a negative direction. A question is how an investor can figure out what expectations are built into the price. Should he rely on sell-side consensus figures? Or should he rely on anecdotes that he gleans from other investors when they discuss the stock? Most companies are complex and key variables move in different directions. And over time, complexity builds up. Shorting on variant perception should therefore be short-term and with a specific event in sight. Soros model is vague. He makes the point that no-one knows what the future holds. The concept of valuation is only useful if the marginal buyer uses it as a criteria for his buy or sell decision. One should not short every stock that has disconnected from fundamentals, only if the false premise on which the trend is built on has been firmly discredited. It does not matter what you think will happen to the cash flows or the valuation. What matters is the fact that other investors are likely to change their minds about whether it is worth owning the asset. If the owners of the stock are primarily value investors, then it makes sense to forecast fundamentals and expected valuation ratios. If most investors are chasing momentum, then one should short the stock once it can be proven that it has lost its momentum. Another strength of the model is the recognition that investors’ own actions may change the fundamentals of the asset. Whether we talk about issuing shares to finance acquisitions that keep up the illusion of EPS growth or reflexivity in a macro sense, it all goes into the equation of whether to buy or short a certain stock. It is simple, really: asset prices are determined by supply and demand. “Valuation” is just a concept we use to predict what the company might be worth in a private market transaction. A target price may also help us to manage the fear we experience when stock prices fall and buy more of it when the price is lower. But it would be naïve to think that a rational calculation of discounted cash flows to the firm is the basis for all stock price movements. Fundamentals are therefore only part of the puzzle, and for a good short we need to take into account both fundamentals and investors’ reaction to them. Expected one-off improvements in business fundamentals: a new product, new regulations, a planned restructuring of the businesses, etc. If we want to minimise buying pressure and maximise selling pressure, then in line with Soros’ approach we should look for instances where: stock price momentum has stopped, an exciting story has been firmly refuted, sell-side has stopped covering the stock, it does not have the potential for open-ended revenue growth, margins are unlikely to go higher, the balance sheet is deteriorating and the money supply is contracting. The ideal situation is when you can control the release of information that proves to the world that a company is a fraud. All the reasons for buying have then been discredited and investors will sell as soon as possible in order to salvage their investment. Investments that less informed investors have bought on the basis of a low valuation multiple may provide a fertile field for shorts. If the reason for the low valuation is technological obsolescence or consumption trends working against the company, any exciting story will probably already have been discredited. A low valuation multiple is hence the only good reason for owning the stock. Once earnings are proven illusory, investors may be slow to react and the result will be a slow grind lower with little volatility. If earnings disappoint due to a build-up of accounting tricks that can no longer be maintained, investors are unlikely to react positively. Shorting stocks with commoditised products where industry supply & demand determine the margins the company is allowed to earn can be dangerous. Industry dynamics are difficult to forecast, and the volatility may be more than most investors are able to stomach. Companies in cyclical industries are hence more difficult to short and it requires an enormous amount of confidence that fundamentals are really deteriorating. Risk-reward can be improved by focusing on stocks with a very high ratio of price-to-replacement cost such that even in the most optimistic scenario, the PE ratio is unlikely to look attractive. If industry supply-demand is likely to diverge in the near term, then all the better. A benefit of shorting stocks in cyclical industries is that commodity prices, or supply-and-demand can shift very rapidly and thus free up that money to be invested in other situations. Shorting stocks due to a high valuation and despite open-ended growth does not appear to be sensible. It is difficult to estimate the discounted cash flows of an asset when most of the value comes from cash flows 10 years hence. And if it is difficult for you, how difficult is it for the average retail investor? The story needs to have been discredited – not only by you, but by the average investor. It is simply unrealistic to think that retail investors or even the average mutual fund manager will be as rational as a dedicated short seller. If it is difficult to tell exactly when growth will stop, the investor is likely to face a lot of volatility, even if he is ultimately proven correct. For open-ended growth stories, it is helpful if sell-side analysts has already given up on the stock and fundamentals have started to deteriorate, as evidenced by falling revenue and rising debt levels. The risk-reward of shorting a stock becomes better when excess money supply growth turns negative, and investors are forced to sell stocks in order to deleverage. Large outflows from mutual funds or ETFs have a similar effect, although such events may be hard to predict in advance. Oaktree Capital’s Howard Marks warned in a recent memo that liquidity can be elusive. Financial instruments that trade with a narrow bid-ask spread today may be virtually impossible to sell tomorrow. Particularly troublesome are structures that are meant to enhance the liquidity of a non-standardized and complex asset. In the decades leading up to the global financial crisis, mortgage-backed securities helped channel savings from European and Japanese institutional investors by creating liquid products with juicy yields. When many of the mortgages from which these MBS and CDOs went sour, liquidity disappeared in an instant. There are reasons to believe that exchange-traded funds (ETFs) are not as bad as mortgage-backed securities. The good thing about ETFs is that we know exactly what assets they own, and for the most part these assets are liquid. So called authorized participants (“AP”) are allowed to create and redeem ETF units, which guarantees that the price of the ETF is close to the neet asset value of its underlying assets. If an ETF is trading at a discount to the market value of its assets, APs can buy the ETF and sell short the underlying assets. It can hand over this to the fund get a redemption basket of securities at NAV. It will then pocket the difference between the ETF price and NAV for a tidy profit. The market behaviour we saw yesterday (dubbed “The ETF liquidity crash” by @BluegrassCap) reminds us however that there are limits to such arbitrage. Heavy selling in ETFs over the weekend caused the S&P 500 to gap down almost 5%. Individual shares such as Baidu and HCA Corporation fell 26% and 49% before recovering most of the fall. This would never happen it is wasn’t for ETFs. So what happened to Baidu and HCA? It appears as if owners of ETFs became worried about weak economic data from China and decided to sell into the open on Monday. Major ETFs such as SPDR’s technology stock ETF “QQQ” fell 13% from Friday’s close to bottom due to this heavy selling pressure. APs then bought the ETF and sold the underlying shares in order to make arbitrage profits. But – the issue is that underlying shares may not be as liquid as the ETF itself. The total outstanding value of ETFs have grown from $750 billion to almost $3.0 trillion since the global financial crisis. 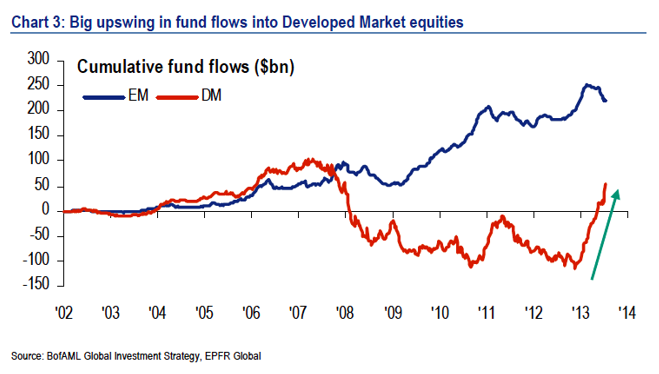 And actively managed funds have seen significant outflows. And so they have become very large compared to the total market capitalizations of underlying assets. And some shares may be less liquid than the average constituent, perhaps due to low free float or low institutional sponsorship. There is another issue: when you sell short shares, you need to borrow the shares from someone. Your broker actually has to find those shares and lend them to you. So if this arbitrage mechanism is put out of play, ETF prices may fall more than is warranted by the movement in the underlying shares. And underlying shares themselves can move downwards dramatically if they are relatively illiquid due to selling pressure by APs. There are profits to be made if you are able to spot such short-term inefficiencies and front-run authorized participants in their quest to lock in ETF price-NAV differentials. Given low holding periods and hedged position, the risk-reward can be highly favourable. Hats off to the guys who bought shares cheaply on NASDAQ and NYSE yesterday. Yesterday’s episode also shows that the limits to arbitrage may be bigger when ETF prices are falling than vice versa. This is because the short sales of stock are more difficult to carry out than short sales of ETFs (you need a broker to find shares that you can borrow). This means ETF prices can fall very rapidly in a crash since APs will find it hard to engage in arbitrage transactions. When retail investors buy ETFs, they typically have no idea what they are getting into. They buy certain “themes” that they have heard about from their friends or from media. Even sophisticated investors may buy ETFs without regard for values under the guise of wanting to have a certain “exposure” or “tactical asset allocation”. Certain wealth managers in Singapore are recommending their clients to invest in themes such as Biotech and Technology via low-cost ETFs as they have low management fees and are liquid. Buying ETFs is appealing from a psychological perspective. We respond to exciting stories, and we want to be part of something that gives us hope. Buying ETFs don’t incur much psychological costs either. 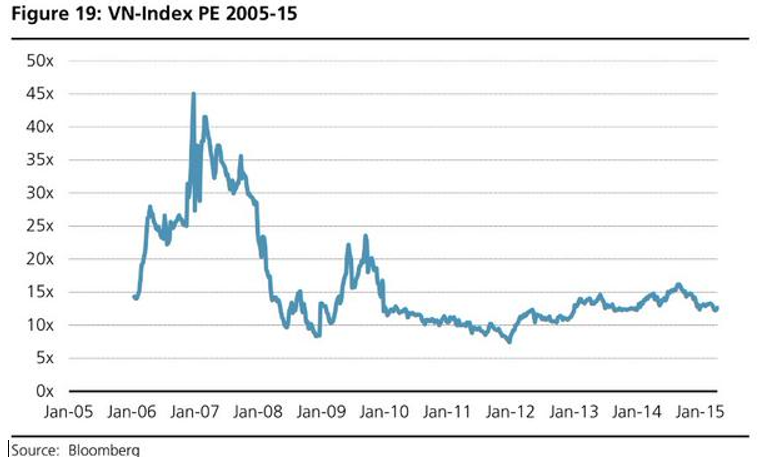 ETFs are perceived to be cheap as management fees are low and bid-ask spreads are tight. Worry is kept low by the fact that they are liquid and can be sold at any time through online trading platform. When a sophisticated investor owns a stock that rises to his target price, he will sell. When a retail investor buys an ETF to get “exposure” or participate in a trend, he may not sell when the price reaches astronomical levels. Instead he will feel superior in his judgment, and see the price increase as evidence of his foresight. If ETF prices crash, he will grasp for any story that explains the price movement. If CNBC headlines tell him that this is just a hick-up and that the bull market is still intact, he may keep his ETFs but stay a bit worried. If ETF prices crash, he will hear convincing arguments of why we are entering into a new Great Depression and he will most likely sell with no regard to underlying value. The selling pressure will escalate because of “information cascades”: the more his friends are selling, the more often he will be reminded that it is the appropriate action to take. Therein lies the reflexivity. Mutual funds are quite similar. Especially in the late 1990s, when retail participation in technology sector funds was large and driven by new era theories reinforced by continuous price increases. The managers of these Internet funds had no choice but to keep buying the shares that fit into their tightly defined investment mandates. Plus, the shares were going up, so why not keep riding the bull? It provides a certain excitement, after all. The assets that ETFs invest in are broader and retail participation is lower. But ETFs are worse in one respect: they are almost all index funds. Mutual fund managers may not outperform their benchmarks, but most would not buy Shake Shack at PE 1000x. As an example: IPO ETFs whose mandates are to buy any IPO that meet liquidity conditions 5 trading days after IPO and sold 2 years after, *will* buy the stock regardless of its price/value ratio. This causes extreme correlation between assets, as Horizon Kinetics pointed out in this quarterly letter. True value investors may short-sell the expensive stocks and buy the cheap, but when the AUM of ETFs is large and share counts are rising – why stand in front of a runaway train? It is much more profitable to front-run ill-suspecting retail investors. There is another type of reflexivity. Asset prices are determined by supply and demand, and when global liquidity is overflowing, some of that liquidity is likely to find its way into stock markets and thus push up prices. Money supply is hard to define though. Some people view gold as the only form of acceptable means of transaction and store of value. Most people believe that liquid types of credit such as bank deposits also serve the purposes of money and can then be used as such. But reality is not as clear-cut. Professor Robert Mundell has pointed out that certain assets such as Unites States Treasuries may have most of the properties of money and can therefore be seen as “money-like”. His point is that increased liquidity of assets increase global liquidity conditions. When investment banks create liquid tranches of RMBS, the underlying mortgage goes from being stuck on an S&Ls balance sheet to something that is marginable and that can be exchanged for other assets. The velocity of money then increases and global liquidity conditions improve. The same can be said for ETFs, which can be used as collateral (which increases creditworthiness) and are often more liquid than underlying assets. ETF inflows hence improve global liquidity, which enables more transactions and more leverage and hence higher asset prices. A more serious issue with ETFs is that APs have the authority to create new ETF shares that don’t need to be backed by anything. Right now, Market Vectors Semiconductor ETF (ticker: SMH) for example has a short interest ratio of 301%. It means that there are 3x more investors that have borrowed the shares and sold them than there are underlying stocks. This becomes especially troublesome when the valuation of the underlying assets is high and ETF AUM is large in relation to underlying market caps. Most of the buyers of these ETFs don’t know that they actually bought them from short-sellers, who in turn got them from Authorized Participants, who created the shares ex nihilo. What happens then if 1/3 of the owners of SMH sell at the same time? The ETF price will fall. APs would buy the ETF, short-sell the underlying shares and hand over the ETF to the fund for a redemption basket of shares. After 1/3 of owners have done this there would be no shares left in the fund and the fund sponsor (firms such as Blackrock and WisdomTree) would be left with an unfunded liability to meet the redemptions. How will they meet this unfunded liability? Or will the broker-dealers that sold the non-existent shares in the first place take the hit? What is interesting of the above scenario is that more short-selling of ETFs creates more shares, that makes the ETF even more undercollateralised. So just like in a run on a currency in a fixed-rate currency regime where market participants actively target currencies with low reserves in relation to money supply, market participants can target ETFs with high short interest ratios and sell them short even more heavily. Sooner or later, the negative price action in the underlying shares transmitted through arbitrage will scare retail investors to sell off their ETF holdings and cause the ETF to go bust. It remains to be seen if this is possible in reality, or if fund providers and regulators are clever enough to avoid such a situation from happening. Don’t own any ETFs unless you know that underlying assets offer good value and/or ETF inflows are likely to continue. Short selling of ETFs may provide excellent risk-reward, especially when the underlying shares are illiquid and ETF share counts are on a downtrend (which is admittedly, hard to prove). Examples may include bank debt ETFs or frontier market equity ETFs. Analyzing the constituents of hot ETFs whose share counts have gone ballistic and then retreated may provide good short ideas. IBB may be a good example right now. If the individual shares are overvalued, we know full well why that is the case. If you believe (as I do) that providers of ETF may be left holding the bag in a blowup, it may be worth shorting their stock. 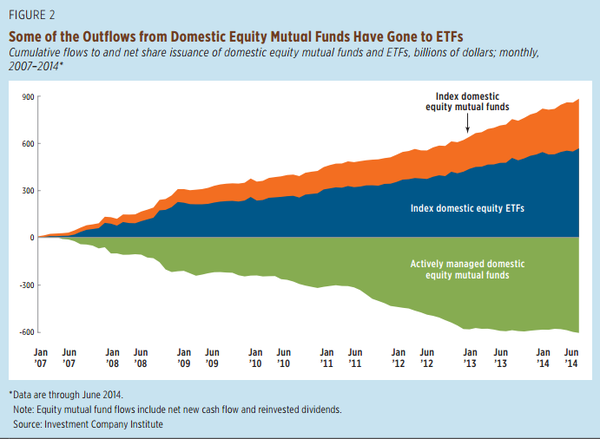 There are some risks of doing so however: inflows into ETFs may continue for another few years. OCBC probably wishes it hadn’t put this picture on the first page of its 2014 annual report. OCBC is known to be one of the best run banks in Asia. But much like the rest of the Singaporean banking system, it has been increasing its risk exposure over the past few years. And the biggest risk facing them is a slowdown of the Chinese economy. Singapore is a stable, mature economy. If bank lending increases by 60 percentage points of GDP in 5 years, it is likely that some of these loans have been made to less creditworthy borrowers. The net loan balance for OCBC itself has risen from SG$81 billion in 2009 to SG$208 billion in 2014. Part of this increase reflects the purchase of ING’s private banking business in Asia and the purchase of Wing Hang bank in Hong Kong. But the bank has also increased its loan book organically by ratching up its mortgage lending and general commerce loans. 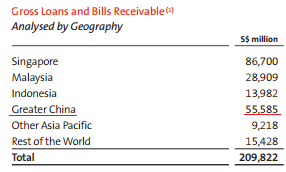 If we look at the geographical breakdown of loans in the annual report, we see that 26% of gross loans were in Greater China in 2014. vs 9% in 2009. This is about the same ratio as Singaporean peer DBS, which many suspect have skeletons in the closet. 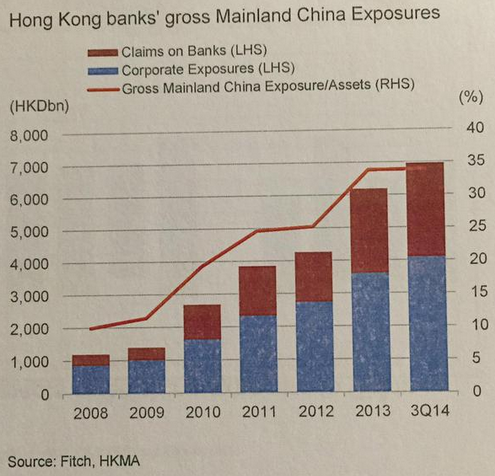 A lot of the increased exposure to Greater China is due to the acquisition of Wing Hang Bank in 2014. Wing Hang was acquired by OCBC for 1.77x tangible book by Samuel Tsien, who took up the role as CEO in 2012. He is an untested card, and the big question is if as conservative and sensible as previous CEO David Connor. “Apart from Shanghai, the Pearl River Delta including Hong Kong and Macau is our bread and butter, offering higher returns and risks simultaneously”. 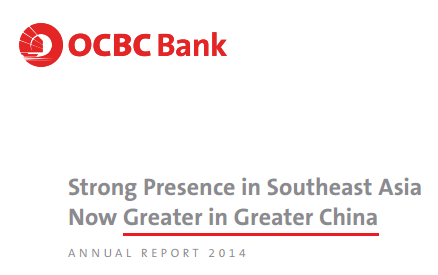 In other words, OCBC has sought out exposure towards yuan carry trade flows and mainland borrowers. Fitch followed up by putting OCBC on a negative watch due to higher credit and operating risks in China compared to Singapore. Wing Hang has exposure to Hong Kong, Macau and China. Industry exposure on the mainland is not evident from its filings, but according to sell side “most [of Wing Hang’s] loans in southern China were related to property development”. Wing Hang’s classification of its loans are based on the “usage of its advances”, not necessarily the region where the ultimate parent of the borrower is located. This makes it more difficult to judge the credit risks Wing Hang has taken on. Mainland property developers such as China Overseas Land routinely borrow in USD/HKD from Hong Kong banks using their Hong Kong subsidiaries. Close to 40% of OCBC’s loan book are in US$ and HK$ loans. Even though direct currency exposures are hedged, credit risk is not. 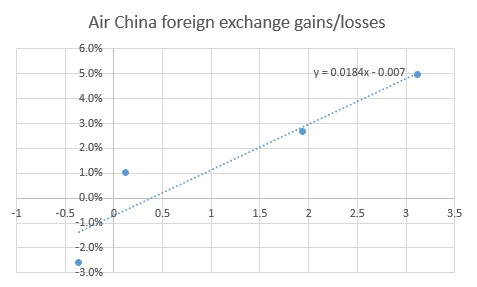 If China devalues its currency by a large amount, non-SOE credits will naturally suffer. Now both OCBC and Wing Hang are well run banks. OCBC’s loan-to-deposit ratio is low at 85% so it is not dependent on wholesale funding. It is implicitly backed by the Singaporean government. But bad debts could weigh on the banks profits for a few years. Leverage ratios are not low either, compared to other banks in Asia. OCBC has an tangible equity/assets ratio of 7.2%. This may be enough for Singapore mortgage lending, but not necessarily when 26% of assets are in Greater China and it has significant exposure to a fragile mainland property market. OCBC’s home market in Singapore may also be an issue from a bad debt perspective. While a rising SIBOR may benefit the net interest margin as mortgages are floating-rate, it will also lead to higher defaults. In 2014, OCBC’s provisioning for loan losses was 17 basis points of gross loans. That’s not very high. As a comparison, one of the best run banks in the world Wells Fargo has had an average provisioning level of 30bps over the last couple of years. If the ratio goes up to 70bps, pretax profit will drop 30-40%. In reality, profits may drop more than that, given the cyclicality of fee & commission income. The benefit of shorting Singaporean banks such as OCBC or DBS is that they have large exposure to mainland borrowers and that the Singaporean economy is weak. Singapore’s capital account is negative partly due to the strong US Dollar and partly due to Singapore’s exposure to the oil & gas industry. Such outflows tend to contract the monetary base, which tightens the economy. And the economy is suffering indeed: Singapore’s CPI inflation rate has been negative 8 months in a row. An easing of monetary policy would require MAS to weaken its currency, which could happen after the elections in October. So shorting Singaporean banks and placing the proceeds in US Dollar provides a win-win: either the MAS weakens the currency or the banks suffer in a weak economy. A depreciation of the renminbi would be icing on the cake. Other banks with mainland exposure include DBS, Bank of East Asia, BoC Hong Kong, ANZ and Standard Chartered. Given that banks to some extent are black boxes, I favour a basket approach to shorting them. 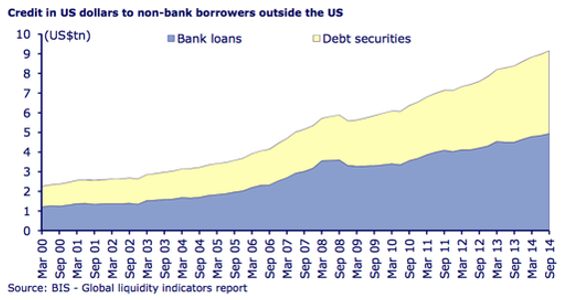 The recent McKinsey report “Debt and (not much) deleveraging” is well worth a read. It shows that we are still in a global credit boom with global debt/GDP rising at a very fast pace: from 220% in 2008 to 260% in 2014. Given that world GDP itself must have been boosted by the debt growth (borrowing money and spending makes it someone else’s income…) then clearly we are set up for a crisis at least somewhere in the world. I will go through the numbers for credit growth in different parts of the world to understand which countries or asset classes might be vulnerable to deflationary credit busts. I will also try to understand which asset classes have seen the largest amount of inflows since the global financial crisis, under the heading “fund leverage”. If the 2008 global financial crisis was caused by easy credit due to financial innovation and deregulation in the US mortgage sector, then this time the risks are primarily in developed market sovereign debt and emerging market corporate debt. The bigger offenders in terms of government debt are Euro periphery countries such as Ireland, Portugal, Greece and Spain as they dealt with the fallouts of a Euro-driven credit bubbles. But Japan also increased its debt/GDP ratio by 64 percentage points to 400% as budget deficits reached 8-9% between 2010 and 2014. United States and United Kingdom have also seen rapidly growing debt/GDP. Government debt in emerging markets look relatively low at the moment. The value of corporate bonds outstanding has grown by $4.3 trillion 2007-2014, compared to $1.2 trillion 2000-2007. Bank lending to corporate borrowers has also increased substantially. It is clear that emerging markets are the big offenders as this chart from BIS clearly tells. The leverage ratios of corporations in emerging market economies have grown from 1.5x to 3.0x since 2008. Real credit growth in the private sector has been by far the largest in countries such as China, Brazil, Turkey and Mexico. India and Australia have also seen significant increases in private sector debt. Starting with China, it is clear that a lot of the increase in corporate debt has gone to the property sector. McKinsey estimates that half of the debt of Chinese households, corporations and governments is directly or indirectly related to real estate. Housing construction accounts for 15% of GDP. These numbers are not far those of Spain’s economy pre-2007 when 50% of loans went to construction companies and real estate developers. Total debt levels in China has nearly quadrupled since 2007: from $7.4 trillion to $28.2 trillion in the second quarter of 2014. China is clearly the big elephant in the room. Given recent exchange rate volatility, whether the corporate debt is denominated in local or foreign currency is another important question. Total USD-denominated debt to non-bank borrowers (both corporate and households) has in any case grown about $4 trillion since the crisis, split almost half-half between debt securities and bank loans. Out of these $4 trillion, almost $800 million comes from Chinese issuers, roughly $150 million from Brazilian issuers and roughly $50 million from Indian issuers. Adjusting for the fact that China’s GDP is 4x larger than Brazil, the relative size of USD-denominated debt issuance has been almost as big in Brazil as in China. The big difference between China and Brazil is that the property sector accounts for the biggest share of non-bank issuance whereas in Brazil the commodity sector accounts for a larger share. Below charts illustrate the link between rising household debt and property market booms. Countries with rising household debt (Australia, Canada, Hong Kong, Korea, New Zealand, Norway, Singapore and Sweden) has seen much higher property price increases than countries with deleveraging households (Greece, Ireland, Italy, Portugal, Spain, the UK and the US). 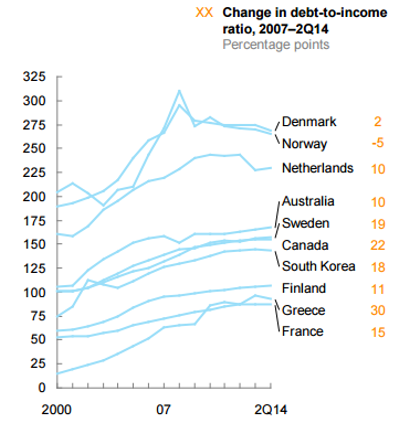 Household debt-to-income ratios are high and have been rising in countries such as Denmark, Norway, Netherlands, Australia, Sweden and Canada. These countries have all experienced property booms. Given low and falling interest rates, housing prices could easily continue their upwards trends. Regions with exposure to commodity-related industries in Canada, Norway and Australia may be exceptions. There is another type of leverage: inflows into bond and equity funds. Once these inflows turn into outflows, funds will be required to sell underlying assets without regard to their economic fundamentals. Liquidity can dry up very quickly. The leverage inherent in funds is therefore similar to that of pure borrowing. Cumulative flows into bond funds (both ETFs and mutual funds) have been massive since the global financial crisis, to the tune of $3 trillion. Fund flows into mutual funds and equity ETFs have been less extreme but still around $500 billion since the global financial crisis. The following chart is from mid-2013, but it indicates that cumulative flows since the financial crisis has been bigger into emerging markets than into developed markets. Whether that is still the case, I am not sure. Shorting sovereign debt in countries such as the PIIGS and Japan. Shorting USD government debt or the currency may not be such a good idea given a $9 trillion short position of the US Dollar driven by QE-driven carry trades. 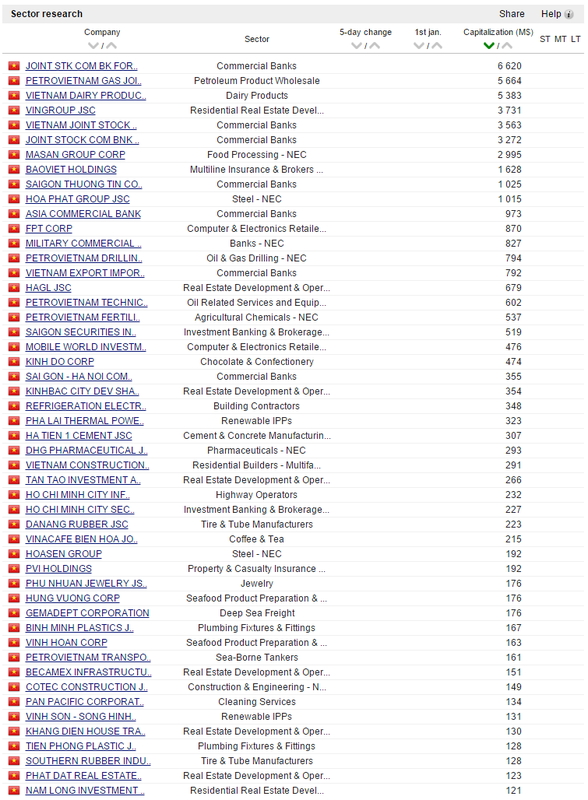 Shorting property developers and other cyclical companies in China. Financials are tricky to short as most of them are state-owned. Both solvency and liquidity issues can easily be resolved by the strong hand of the government. Of course, debt problems may already be priced in when it comes to individual names. Well – you won’t have to wait much longer. Foreign ownership limits will be raised from 49% to 100% in most major industries in September this year. It is likely to lead to massive capital inflows into the Vietnamese market. Less strict foreign ownership limits will also enable Vietnam to be ranked by MSCI as an “emerging market” rather than a “frontier market”. There are over US$110 billion in ETFs tracking emerging market indices, and even more quasi-index funds (a.k.a. “mutual funds”) whose performance are judged against MSCI emerging market indices. They will also have to buy more Vietnamese stocks once the country has been upgraded to emerging market status. So with a fixed supply of stocks and a massive increase in demand, only one thing can happen: stock prices will go up. Large capital inflows will also have a second-order effect: since Vietnam is running a fixed exchange rate against the US Dollar, the State Bank of Vietnam will be forced to buy foreign currency as inflows start to pick up. An example of what George Soros would call “reflexivity”. SBV buying of foreign currency will lead to a build up of FX reserves and – unless sterilized – an increase in the narrow money supply. Inflows from 2014 has already led to an increase in m0 of +22% YoY. Vietnam’s banking system is reserve constrained and higher reserves will have a multiplier effect into broader credit growth. Some money will surely flow into the equity markets and deliver what I believe to be a solid, sustainable stock market boom. In addition, the State Bank of Vietnam has pledged to keep monetary policy loose in 2015. 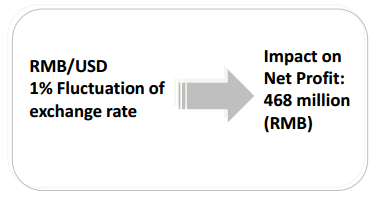 The inflation rate has come down to 1% in June 2015 from 5% in June 2014, which will enable SBV to lower interest rates and still achieve its policy goal of “controlling inflation”. Since the government introduced free market incentives in the economy in 1986, the economy has been the fastest growing in the world in US Dollar terms. In real terms, GDP growth has held steady at 6-8% per year. Demographics are great: the average age is 23 years and the population grows by 1.0% per year. Manufacturing wages are less than $2,000 per year compared with $10,000 per year across the border in China. Vietnam is following the example of China, Korea and Japan to grow its economy by infant protection and export discipline. Exports have risen 15-20% per year over the past decade and continue to grow. Samsung now manufacturers half of its mobile phones in Vietnam. In a survey in Korea, companies said that Vietnam is the most promising emerging market. PWC expects Vietnam to be the second fastest growing economy in the world until 2050 after Nigeria. What you see now is just the beginning. If banking system profitability recovers, there is significant upside to this forward earnings estimate. A key factor in the non-performing loan issue that has plagued the banking sector is falling property prices since the 2006-2010 credit bubble. The good news is that property prices have finally started to pick up since last year and are continuing its upward trend. Properties are cheap – consultants are quoting rental yields of 6-10% depending on the type of property. Certainly much cheaper than major cities in mainland China where yields have come down to 2-3%. As property is often used as collateral in loan transactions, rising property prices may ease banking sector insolvency issues and boost medium-term credit growth. Vietnam as a country is similar to China 15 years ago. Corporate governance seems to be just as bad as in China, Korea and Russia. Insider trading and front-running is rampant. A lot of the listed companies are simply rent-seeking operations that have no competitive advantage other than government protection. So if you were a Chinese investor in the year 2000, what stocks should you have focused on? First: consumer stocks such as Moutai and Changyu and great manufacturing companies. Second: great exporters such as Gree and Haier. Third: Technology firms such as Tencent, Baidu and HIKVision. Most of these stocks have performed spectacularly, but did not offer their shares to the public until the mid-to-late-2000s. In Vietnam, the largest consumer companies are Vietnam Dairy Corporation (“Vinamilk”), Masan and Kinh Do Corporation. Vinamilk trades at PE 14x for what is an excellent business. The future is somewhat uncertain as the current chairwoman is due to step down next year but the potential for milk consumption in Vietnam is mouth watering. Masan owns a Tungsten mine and for that reason, may not see its foreign ownership limit lifted when September comes. DHG Pharmaceutical is inexpensive and is said to be a well run firm. FPT is a technology conglomerate with a promising software outsourcing operation similar to Infosys. But management lacks focus and is reliant on its dying distribution business for much of its cash flows. Bank deposits/GDP in Vietnam is 12% vs 50% in China so the room for growth in the banking industry is massive. Then again one should be careful about banks in fixed currency regimes as they tend to lead to recurring boom/bust processes. Brokerage firm Saigon Securities is trading at a trailing PE ratio of 13x. If I am right about the coming boom in Vietnamese equities, Saigon Securities will certainly benefit – if anyone. Auto distribution is another promising industry but the companies are too small for institutional investors. For retail investors, the only options are ETFs or mutual funds. 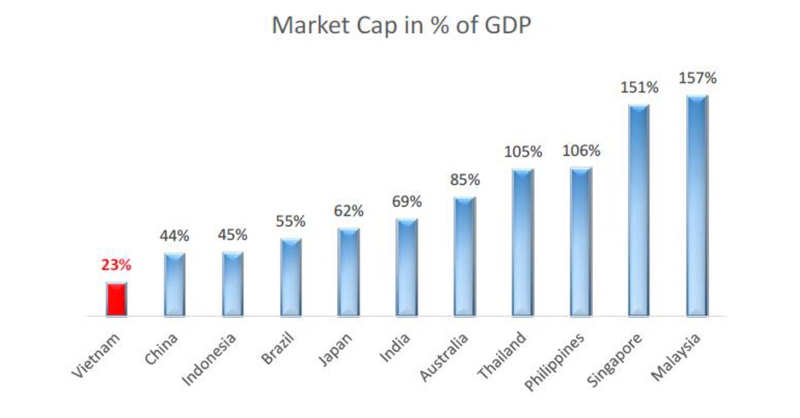 Market Vectors Vietnam ETF is a trap though – a large percentage of the holdings is in Thailand, not Vietnam. And the stock exposure is less than exciting. Fund managers such as Dragon Capital and PXP Asset Management offer UCITS funds with OK exposure and OK fees.